HomeTemple NewsImperial Potentate, Gary Bergenske and Lady Anne’s first visit of the year, Hadji Shriners in Pensacola, Florida. Gary Bergenske, the Imperial Potentate of Shriners International – the top ranking Shriner in the world – visited the Hadji Shriners of Pensacola Friday night. And he had a very special guest with him. Bergenske, who lives in Orlando with his wife of 13 years, Anne, was with Isabella Rose, a local patient who represented the 22-location hospital system as one of two national ambassadors. Rose had a cleft lip and palate repair that has allowed her to continue doing what she loves: Sing! The Hadji Shriners are celebrating their 50th year in Pensacola. They support care of children and travel to several Shriners Hospitals for Children, including locations in Tampa, Galveston Texas and Greenville, South Carolina. Hadji’s has approximately 700 members. Friday marked the first official visit Bergenske made throughout the world after becoming Imperial Potentate on July 13. As Imperial Potentate, he is the highest-ranking Shriner in the world and serves as president of the Board of Directors of Shriners International, chairman of the Board of Directors of Shriners Hospitals for Children®, and a member of the Board of Trustees of Shriners Hospitals for Children. 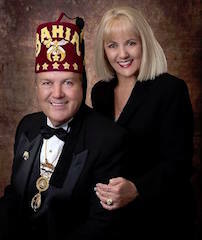 Gary and Anne Bergenske — the First Lady of Shriners International — have six children and 11 grandchildren together.